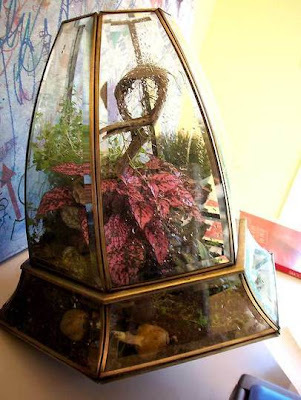 Thanks to apartmenttherapy.com for sharing the latest and greatest new installment in Kat Geiger's terrarium repotroire. Light fixtures repurposed as terrariums with a great wardian case/ steam punk vibe. We had a porch light just like the one above at the house in which I grew up. That is great. What a creative idea. I like that. Steam punk came to my mind too.